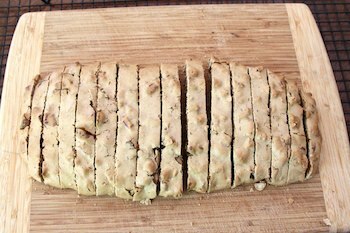 Sourdough biscotti have been on my mind for a while, but they posed a bit of a challenge: with sourdough starter comes water, and extra water is not something that we usually want in any cookie dough, never mind biscotti. 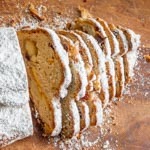 For these “twice-baked” cookies, the dough is formed into a log and partially baked, then sliced and baked again until dry. Extra water is just not helpful here. 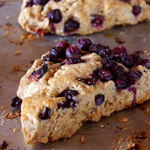 The solution I came to, in addition to using a stiff (50%-hydration) starter, is to cut down on the sugar, which behaves very much like a liquid ingredient in a dough. (If you don’t believe me, try taking a basic unsweetened dough and mixing in a bunch of sugar; you’ll swear you just dumped a bucket of water in there.) So these have about 30% less sugar than you’ll see in many biscotti recipes, but interestingly, they taste plenty sweet to me. I would not market them as “diet biscotti.” They’re definitely dessert. The dough is still plenty wet, and log-forming is a little tricky. I found a plastic dough scraper helpful to scrape up and shape and smooth the sides once the dough is on the parchment-lined pan. 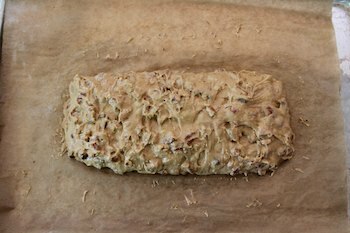 But even if you make your log nice and compact, it’s going to start flattening out before it even hits the oven, and after a few minutes in there will look like a praline on a hot New Orleans sidewalk. Don’t panic. It will rise (a little) and have a pretty good biscotti shape by the time it’s done. I’m bound to get the question, So why bother with the sourdough? Why not just make them with baking soda or baking powder like a normal person? It’s because I can, OK? 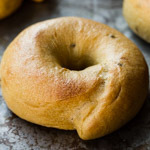 It might also be because I really like the texture of these — dense and crunchy but tender and crumbly at the same time, and really good for coffee-dipping — but mostly because I can. Now go find someone else to heckle. The ginger in these is Buderim ginger I buy at Whole Foods. It is labeled “sweetened” and “uncrystallized,” and I love it for baking (and eating) because, unlike most candied ginger, the texture is slightly crunchy and not at all at sticky or gummy. This is especially important for these biscotti, because sticky ginger would make them extremely difficult to slice while hot. What’s more, you can chop this ginger without having to constantly unstick it from your knife. Preheat the oven to 325F on the convection setting, if you have one, or 350F on the regular bake setting. In the bowl of a stand mixer fitted with a dough hook, combine the flour, cinnamon, ground ginger, lemon zest, starter, eggs, and vanilla. mix in low speed until the ingredients are well-combined. The dough will be very stiff at this point. Continue mixing in low or medium speed unti the gluten reaches a low-medium level of gluten development. Add the butter and mix until it is completely incorporated. 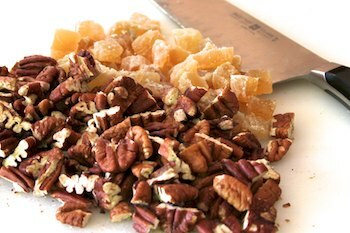 Add the pecans and chopped ginger. Mix in low speed until they are evenly distributed through the dough. Bake for about 35 minutes, until the dough is firm but not hard. Remove to a cutting board and slice into 3/4-inch slices (or whatever thickness you like). Turn the oven down to 250F. Stand the sliced biscotti up on the parchment-lined baking sheet and return them to the oven for 40 – 50 minutes, until dry. Love the flavor!!! looks yumm. This is a must try! What inspiration you have! looks so great! I like biscotti! 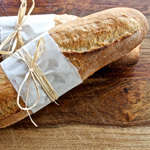 What about a dried sourdough, ever consider it? What a lovely little treat! Very inspiring indeed! WOW!!!!!! luks amazing… biscotti luks fanatstic… yummy..
Susan, thanks for solving the sugar mystery. 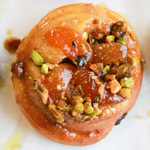 After my own spotty attempts at making pastry from leftover sourdough, I was always unwilling to decrease sugar content. I shall rethink that point of view. Also thanks for the tip on dried ginger! …priceless. That’s usually my reason for putting sourdough into everything. lol!! I have to try these. I have a thing for biscotti and the sourdough use sounds interesting. I’m also very curious about the ginger. I’ll have to look for that at WF today! Awesome job. Great pictures too. 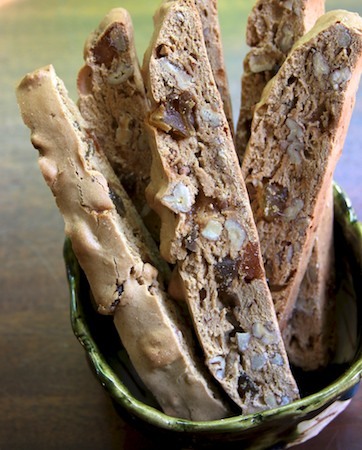 I love biscotti, and my favorite recipe for it is Brownie Biscotti. Thanks for sharing! Susan, i made this biscotty today and I have to say that this a really wonderful recipy. I prepared exactly according with you recipy. Although I am afraid that my biscotty may be a bit sour – but it wasn’t! 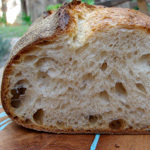 I’ll bake another sweet recipies from your site with sourdough starter’s use. I made these biscotti last night. 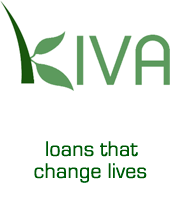 Everything turned out like described, the times were just right, all the info very helpful. I put ground cloves because I didn’t have ground ginger. For my taste they are a bit too sweet and again for my taste I would put a bit less chopped ginger. Thank you very much, I’ll try other recipes from this site. 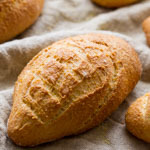 What a great idea, to use sourdough like this. Are you using an active starter, or a more dormant one, straight from the fridge? Kristen — this is an active starter. 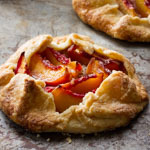 These look amazing, and I would love to make them! What would be the best way to turn my 100% hydration starter into a 50% one? 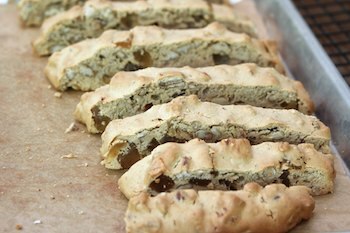 I did a version of these using a Maida Heatter recipe for health food biscotti, They came out ok. but I toasted them for too long. Still the flavor is nice. Thanks for the inspiration! What’s a good substitute for sourdough starter? I have a potato flake sourdough starter. Can I use this with your recipe? Real trippy recipe. But (is it just me or what? ), the recipe doesn’t indicate when to put in the salt? Or?